There is a lot I do NOT know about the coyotes. Even observing them for hundreds of hrs over many years. Some behaviors I only seen but a few times. So claiming they are fact, isn’t necessarily true in all cases. But were true as to what I had seen or how it appeared. Much of their behaviors (most) all coyotes will show the same behaviors eventually. Some behaviors which have been text book true. Is the wariness of the old alpha female. Time after time I have watched them. They are pretty consistent. One Winter day 3 wk in December. I was observing an old alpha pair with their 5 yearlings. Before they all bedded down in a loose group out near the 1/2 mile. The old male walked up to each pup. Took them by the neck & pushed their head & shoulders down on the snow. While the pups hind legs were still standing. The old female sat idly by watching this un-fold. When the old male got to the last pup out of the litter of 5. 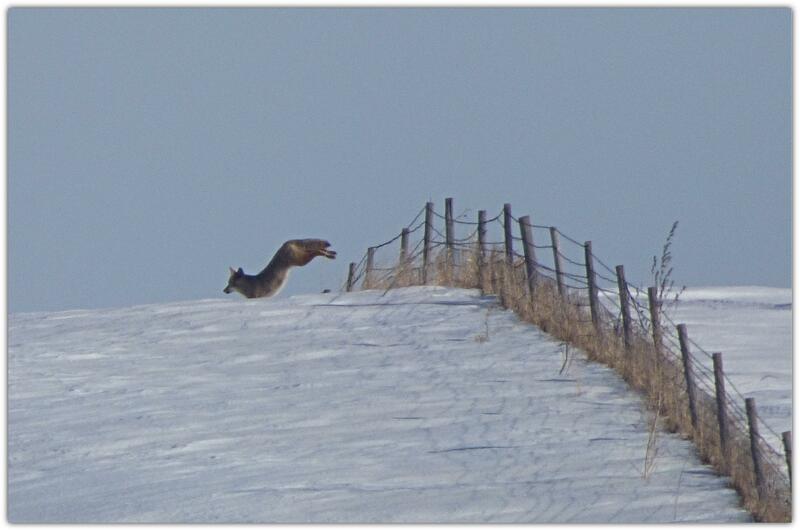 The old female came over & they both pushed (her) head down on the snow. I believe all of the pups were male, except for the last pup. They held her there maybe 15-20 seconds or so. The next day & the rest of the Winter. All 5 of those yearlings were gone. I believe the old female was coming into heat. Thus it was time to scatter their litter. That alpha pair would have 5 pups each year that I observed. Two yrs in a row. Their yearlings disappeared end of the 3rd wk in December. (I believe) the reason it occurred. Was due, to the old female coming into heat. Notice that pic where the three are in the cornfield, It seems the one watching the other two with its tail between its legs could be the odd man out in this situation. Or could it be a female offspring left over to help rear the next batch of pups? Any thoughts? The above kit is 5wks old. Can walk ok, but still a little wobbly & gets tired rather quick. Kits are born the color above with dark slate blue eyes. Their eyes turn all amber by 8+ wks old. By 10-12 wks old. They typically have their full fur color. At 12 wks old they can survive on their own. Most Reds pair up in the latter part of November-into January. A little before the coyotes do. 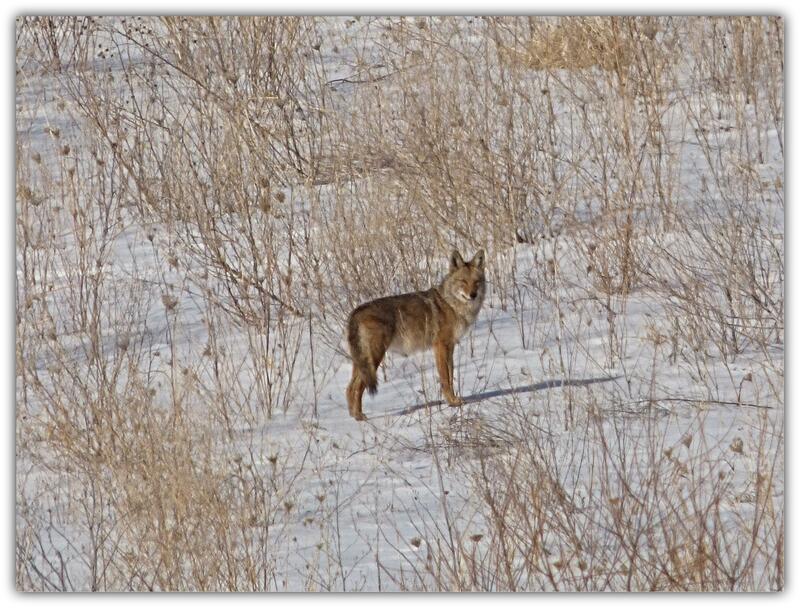 Coyotes pair up latter part of December-into February. What I have read from Biologists, as for the Reds…Gestation is 61-62 days. When either canine actually breeds. Is their call. I read once a guy claimed when coyotes make a kill. They allow other “non-related” coyotes join in on the feast. Not true IMO. Alpha coyotes are territorial & do not subscribe to free handouts to strangers/trespassers. Above is an old Female I’ve observed for numerous yrs. She lived to be 8+ yrs old. Then suddenly disappeared. Word was she was there at that den site 2 yrs prior. So that would make her roughly 8yrs old. She had an Earthen den right next to a field drive culvert. She used them both. Females are the primary caretakers of their kits. Even while there are young in the den. The female will go on short hunts alone in the late evening & early morning. In the evening about an hr before Sunset. She may take some of her kits out exploring, learning & hunting. Kits are weaned by 5 wks old. But will still suckle after that, if the female stays wet & tolerates their pointed milk teeth. I’ve seen early morning a female come back from hunting. Then stand, staring down the entrance hole & call out her pups. They pour out & start to nursing right away. Like they are starving. If by the age of 5 wks old. If the female dies or gets killed. Then the male will take over care of the litter. A few yrs back I knew of 6 active den sites in a 7 mile radius. The age of the litter varied roughly 6 wks best I could estimate. One late litter I seen a number of yrs ago. That occurred mid October & those kits were around 11-12 wks old. That was an oddity to see. I would’ve never thought it true. Had I not seen it. A few yrs ago. There were 2 other active dens 1/2 mile from her den. Both of those dens only had 2 kits each. So I believe, those young females were her off-spring. Et their kits were sired by the male to the old female. Last Spring I observed a litter of 14 kits. Farm lady said the female was at least 7 yrs old. This reply was modified 4 weeks ago by coydog. A few things; Red Fox do not have near the sharp eye sight as do the coyotes. They’ll also often dismiss ambient sounds around them. Such as a hunter getting near. Coyotes pay attention to ALL noises. So best to stealth in like a stalking cat. As for the Reds. High pitched noises peak their interest much more than deeper base tones. Higher the pitch sound. The more it will peak a Red’s interest. Coyotes; They miss very little. Specifically a local territorial older coyote. A pair of coyotes on the move. 99.9% of the time. The female sets the direction & the pace. Where she goes, he follows. She is also, (most often) the last of the two to lay her head down. She is the wariest of the two. When they bed down for the day. An old female is tops. If a hunter can fool her. That is something. When they dig a den or do a “clean-out” The male does the digging. If she doesn’t like his work. She may not accept that den hole & move on elsewhere. Coyotes routinely hug the inner 1/4 mile area of a 1 square mile area. Most all of the time. 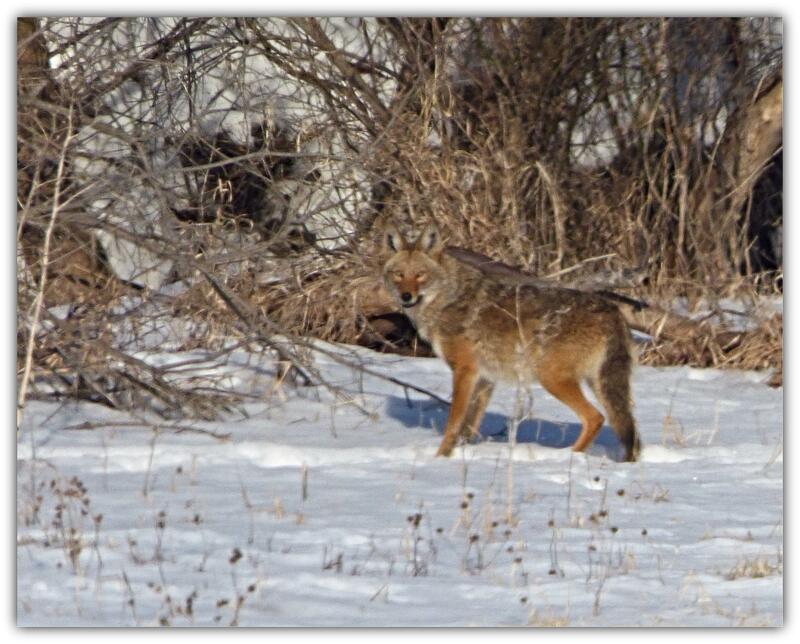 Both coyotes & the Red’s use the up-wind areas mainly as transition areas. To get from one down-wind area to the next. 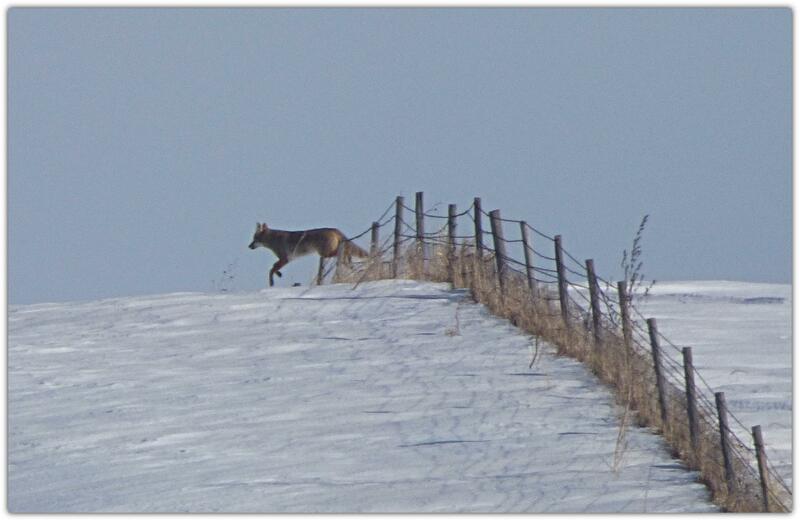 Most coyotes are bedded down for the day @ either pre-Sunrise up until 9-10am. Few stragglers on the move after 10am. Coyotes territories are roughly 5-7 square miles in total mass in my old hunt areas. Generally the territory is oblong & they often over lap a 1/4 mile or so. With the neighboring alpha pair. I call that over-lap area. The “buffer area” Because a certain degree of trespassing is tolerated by the local pair. When young coyote pups near Winter. They can often be found on the outer area’s of their parents territories. If you call in a pair or stalk a pair. Shoot the female 1st. Because often the male will linger some. Maybe offering a shot on him? Same goes for the Reds. This reply was modified 1 month, 1 week ago by coydog. Sweet! You are correct! A lot of guys kill them and have no clue about them. I haven’t carried a center rifle in a few years if I call them in shotgun range I learn a lot more. I’ve seen & learned plenty just observing. This Winter rounds off my 54 th year predator hunting. Great memories. All I want now is a lion, the frosting on the cake. Top 3 ended up chasing a herd of deer. Thus they jumped the fence in hot pursuit. Bottom 2 pics are the same coyote. He was a biggun. They are lucky I was not after them. I never learned much from a dead critter. Observe them while they are alive. Thanks for posting. Love seeing the picks of coyotes and red balls. As Always, love your pics. It was a nice way to begin my morning just going over them. Do you have any leads that are panning out on your lion hunt? With all the snow I bet you put in a few extra miles this year. 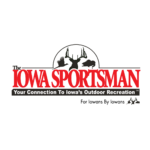 Good luck in your hunt…..
No leads as of late. You as well as most realize. It is luck of the draw to get on a lion. They are few & far between in any given area. Last Winter I could’ve got up on one early am. As an ex-co worker seen one cross Hwy 14 North of M’town on his way to work. (lion crossed into the Air port section). To date…4 lion sightings in that section. There was good snow cover that day also. He failed to contact me right then. Lion was out in the wide open rolling crop hills. Would’ve been hammer time. Oh, well. No quit in me. Seen roughly 20+ coyotes this yr. Pretty shabby pop.